t's no news that the 3 most powerful people according to the Nigerian constitution all use Mercedes-Benz as their official car, the president, vice president and the Senate president all use Mercedes Benz, a background check into some of the state governors garages too, we can reliably write at least 70-80% of these governors have a Mercedes Benz car in their fleet. 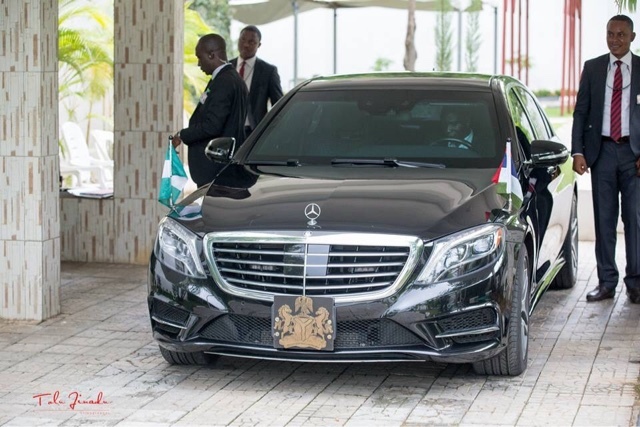 There have been an outcry from Nigerians and the social media as to why politicians prefer a German brand as to a Nigerian brand in as much as we have a local firm here which makes vehicles as well. We did an investigation in these outcries, and we found the following reasons why the Federal Government, National Assembly, and State Govs. will still continue patronizing Mercedes-Benz brand. It's no news that the brand has been around for quite some time, a quick glance at their Wikipedia page shows that it was founded in 1926, so technically, we are looking at a 91-year-old brand, despite that, they seem not to take to chance, you will always see any of their representatives in government house, Aso Rock or they have a clique with some of the staffs there. Likewise, on the social media, MB is among the most active auto brand on Twitter, IG, and the rest, when you make an inquiry, be rest assured that with 48-hours your inquiry will be treated, they are always advertising and showcasing their new range of products and services. Life is precious, and life can't be on autopilot once its gone. The first thing on the mind of any politician is how am I? Mercedes-Benz seems to be a brand for such folks, virtually all their vehicles have safety certifications, for example, the armored 550 4Matic car has a ballistic certification and many others. Have you ever asked, what will make a president of a nation to patronize a car outside his country? That has to do with loyalty, selflessness, and integrity. Having been in the game for 91-years, they have learned the modulus Operandi in dealing with government officials and therefore vouch for their brand if anything goes wrong. Imagine been in a car that defines luxury at its finest. We reviewed a car recently, it was configured that when it goes into a pit or potholes, the passenger does no feel it as it automatically adjusts itself, that's what MB cars are known for, with the addition of Maybach into the league, life just get better. What every man wants is to have a value for his money. Nothing makes a car more useless when you can't find the service area or its part anywhere. At least there are 2 service centers of MB in every state of the federation which makes it accessible and easy to get a snap. It has been proven that bad roads make even the most expensive car in the world to wear out within the shortest period of time. Have you heard of the world German-Machine? MB are proven to be strong and withstand all manner of bad roads no wonder our politicians use it as their official cars. Any car that will displace Mercedes-Benz must be ready to do extra more.